Designed to provide your special guests with an extraordinary blue cruise experience. Each detail is carefully thought out to ensure passengers will experience the comfort of a five-star hotel in the unique waters of the Mediterranean and Aegean. She has been serving since 2007 with a hundred percent satisfaction guarantee and is one of the most preferred super luxury yachts to visitors of guletyacht.net with numerous references and repeated reservations. The super luxury yacht is 36 meters long with 2 Master, 2 Double, 2 Twin Cabins, a total accommodation capacity of 12 guests. Each cabin is well-equipped with private shower and wc facilities and air conditioning to ensure a comfortable stay on hot summer days.There is also a Jacuzzi in the master cabin. All cabins have TV, DVD and music system. Yacht also has a professional 5 person crew to provide blue cruise services that match the luxury and design of the yacht. That crew consists of the captain, cook, deckhand as well as service personnel. They have accommodation separate from the passengers. The chef’s skills ensures meals will lack nothing in comparison with what a five-star hotel can offer, in Turkish and International Cuisine. You will enjoy the most beautiful coves and islands during the cruise while the service staff organize meals, cleaning and other daily services. The comfort of guests is the top priority of the professional crew, well-versed in looking after their every need. The decor of the Gulet She is tasteful, with its interior design exuding luxury. There is a TV, DVD and music system in saloon for your entertainment. You can lie back on cushions and sunbathe while your meals are being prepared in a fully equipped separate kitchen. Sheoffers a joyful atmosphere to its guests with its jacuzzi on the deck. Equipment on board to add to the facilities available during your luxury cruise include Canoe, Snorkelling Equipments, Fishing Equipments, Water Ski, Wakeboard and Ringo. There is a 80 Hp service boat and you may ask your yacht charter representative for extra water sports. She has the best technical equipment that make long journeys a simple exercise. You will experience the most luxurious service and when you return home, you will be relaxed and reinvigorated. The experience of exploring the Aegean and Mediterranean with family and friends is wonderful. Gulet you can spend a pleasant blue cruise, visiting popular places like Bodrum, Marmaris, Fethiye, Göcek and Greek Islands. Perla Del Mar 2 has been serving since 2007 with a hundred percent satisfaction guarantee and is one of the most preferred super luxury yachts to visitors of guletyacht.net with numerous references and repeated reservations. The super luxury yacht is 36 meters long with 2 Master, 2 Double, 2 Twin Cabins, a total accommodation capacity of 12 guests. Each cabin is well-equipped with private shower and wc facilities and air conditioning to ensure a comfortable stay on hot summer days.There is also a Jacuzzi in the master cabin. All cabins have TV, DVD and music system. Perla Del Mar 2 yacht also has a professional 5 person crew to provide blue cruise services that match the luxury and design of the yacht. That crew consists of the captain, cook, deckhand as well as service personnel. They have accommodation separate from the passengers. The chef’s skills ensures meals will lack nothing in comparison with what a five-star hotel can offer, in Turkish and International Cuisine. You will enjoy the most beautiful coves and islands during the cruise while the service staff organize meals, cleaning and other daily services. The comfort of guests is the top priority of the professional crew, well-versed in looking after their every need. The decor of the Gulet Perla Del Mar 2 is tasteful, with its interior design exuding luxury. There is a TV, DVD and music system in saloon for your entertainment. You can lie back on cushions and sunbathe while your meals are being prepared in a fully equipped separate kitchen. The Perla Del Mar 2 offers a joyful atmosphere to its guests with its jacuzzi on the deck. Equipment on board to add to the facilities available during your luxury cruise include Canoe, Snorkelling Equipments, Fishing Equipments, Water Ski, Wakeboard and Ringo. There is a 80 Hp service boat and you may ask your yacht charter representative for extra water sports. Gulet Perla Del Mar 2 has the best technical equipment that make long journeys a simple exercise. You will experience the most luxurious service and when you return home, you will be relaxed and reinvigorated. The experience of exploring the Aegean and Mediterranean with family and friends is wonderful. 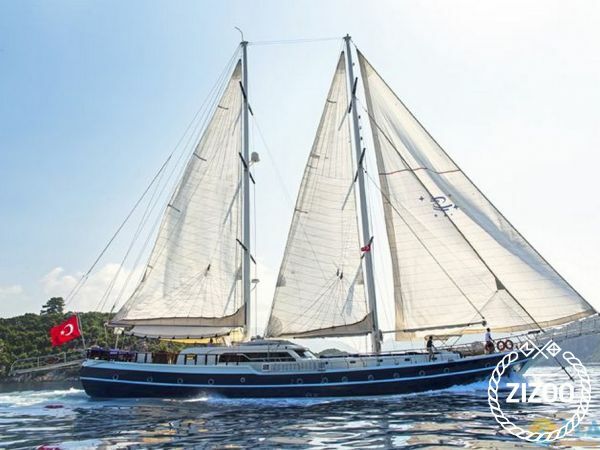 With Perla Del Mar 2 Gulet you can spend a pleasant blue cruise, visiting popular places like Bodrum, Marmaris, Fethiye, Göcek and Greek Islands.